I am excited to announce that Hakiri supports teams! Invite your collaborators from GitHub and assign read or read & write permissions to them, so they can view security issues or help manage them. 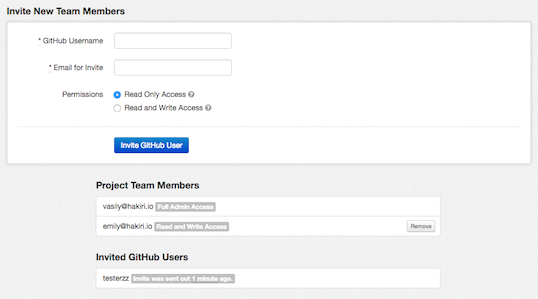 People you are inviting don’t have to be members of teams on GitHub, which means that anyone who has an account on GitHub can be a team member on Hakiri. Read-only permissions allow your collaborators to look at your project’s branches, builds, and security warnings. Read and write permissions let them follow and unfollow branches, delete builds, add new stack technologies, and mark warnings as false positives. To invite a team member go to your project settings and fill out their GitHub username and email where an invite should be sent. If they are not registered on Hakiri, they will receive an email asking them to sign up. If they are already a member, they will receive an email notification and your project will automatically show up in their dashboard. Teams are available to all public projects for free. If you want teams for private projects, please upgrade to the medium or large plan.